Matt Gaetz has become a conservative hero and a liberal villain with his strong support of President Trump. Politics is a rough sport and Gaetz plays the game better than most. He is fearless when it comes to defending Trump and for that the House Dems target him. 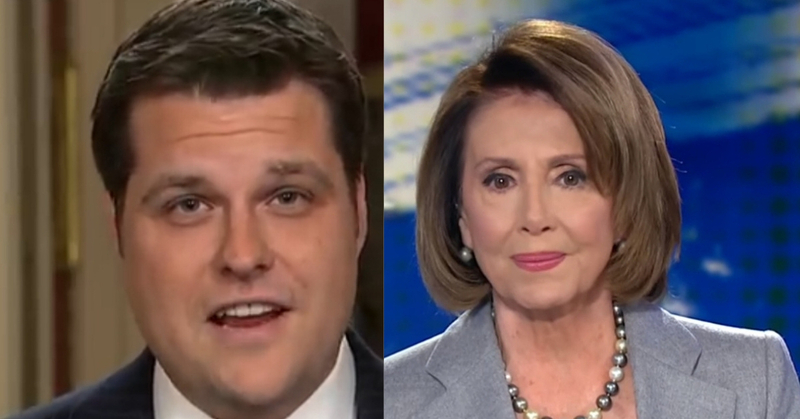 But two can play at that game and Gaetz just found a bunch of skeletons in the House Dems closet and exposed them on Fox News for all to see. Gaetz wrote: Anti-Trump Democrats in Washington have egg on their face. They’re reacting inconsistently and frantically as the Mueller investigation winds down absent proof of collusion. Intel Chairman Adam Schiff has promised for months that he “had the goods” showing “demonstrable evidence” of Trump’s collusion with Russia. It’s evidence we’ve never seen because it doesn’t exist. To cover for this now-exposed lie, House Democrats just launched a new 81-pronged investigation. They aren’t just fishing; they’re fishing with dynamite. But this new zeal for endless, unfocused probing of the executive branch in the name of “oversight” is a newfound passion for House Democrats. Democrats’ harassment of President Trump today makes their silence during the Obama administration even more conspicuous. Consider Gerald Walpin, the inspector general of AmeriCorps. Walpin found that Kevin Johnson, former NBA star and mayor of Sacramento, had engaged in serial “inappropriate conduct” with high school girls, and blatantly misused nearly a million dollars in federal grants. Taxpayer dollars were spent trying to silence underage victims of sexual assault. Walpin did important, revealing work — so you’d expect that he would have been praised for his discoveries, right? Wrong: Gerald Walpin was unceremoniously fired. Congress was not notified in advance, as is required by law, and, even worse, the White House did not cut its ties with Kevin Johnson. It even awarded Sacramento a new $650,000 AmeriCorps grant. Hearings held by the Democrat-led House of Representatives on this topic? Zero. Democrat-led requests for documents? Subpoenas? Depositions? Zero, zero, and zero. Walpin’s firing was in no way an isolated incident. Other Inspectors General from Amtrak to OMB were abused, threatened, fired, and forced into retirement by the Obama administration. Why wasn’t Congress up in arms about the mistreatment of government watchdogs? The answer is simple: these abuses happened in the first years of Obama’s presidency, when the House was under Democrat control, and scandals of varying magnitudes were quickly and dutifully swept under the rug. Foreign aid to terrorist organizations? No hearings. No document requests. No subpoenas. How about the Obama administration keeping tabs on critics of ObamaCare? Trying to collect data on (and silence) political opposition? No hearings. No document requests. How about Obama’s vast and wasteful “stimulus package,” which stunted job growth, wasted public funds, and — surely coincidentally! — only benefited solidly “blue” states and districts? No hearings. No document requests. No subpoenas. Holding Congressional hearings is the purview of the majority, and during the first years of the Obama administration, Democrats could not be bothered. Compare that to Democrats today. They have sent countless letters to the White House and every department in the Executive Branch, demanding documents, testimony, and information. The Judiciary and Oversight Committees have become tools to distract the President with a fact-free impeachment case. What a sham — and what a shame. Democrats want to peer into every second of President Trump’s life, hoping to find a smoking gun. After three years and tens of millions of taxpayer dollars spent on the Mueller probe, they’re now saying that his report is not a conclusion, but instead, a jumping-off point for more investigations. Their witch hunt is nothing more than a sham investigation in search of a fabricated crime, but they’re still going full steam ahead. Where was the Scooby Gang when America needed them, when we had a reckless and destructive Executive Branch in desperate need of scrutiny? They were drinking the Kool-Aid, and pretending that nothing was wrong. If Democrats insist on looking for skeletons in the closet, they should take a long look at themselves. They’ve hidden more than their fair share.